Glyko Karpouzi is a fruit preserve made with the rind of watermelon (karpouzi) in Greek. These fruit preserves are called “Glyka tou Koutaliou” in Greek, which translates as “spoon sweets” as they are usually served in a spoon (occasionally with a small fork) as a gesture of hospitality. They can be made from almost any fruit, though sour and bitter fruits are especially prized. There are even spoon sweets made from vegetables such as carrots, eggplants, tomatoes etc. Whole fruit preserves can be found in most Greek and Cypriot homes. They are made by slowly simmering fruit in water and sugar over several hours, until the syrup sets. A small quantity of lemon juice is often added to preserve the fruit’s original colour, as well as to prevent sugar from crystallizing. The method of preparation is essentially similar to that of marmalade, except that fruit pieces remain whole. Some of the fruits that are used include citrus (bitter oranges), grapes, mulberries, bergamot, apricots, cherries, oranges, sour cherries, lemons, pomegranates, quinces, strawberries, apples, dates, figs, prunes, and tangerines. Other varieties include vegetables, pistachios, hazelnuts, green (immature) walnuts and other nuts, and flower petals like rose or citrus flower blossoms. Many fruits or parts of fruits that are normally inedible, such as citrus peel and water melon rind, can be made into sweet, flavourful preserves, as can unripe nuts and vegetables. To make the spoon sweets crunchier the fruit or vegetable is soaked in a solution of pickling lime dissolved in water. They let it rest for two or more hours and then the fruit is washed very well before proceeding to make the preserve. *Quick lime (asvestis) or pickling lime is an ingredient used lots of years ago and back then they would would get it from constructions. The calcium firms up the vegetable or fruit cell wall, so that it doesn’t get mushy. I do not know where you can find pickling lime abroad but in Cyprus you can now find it in supermarkets. You can also find it online and in case you cannot find some, the worst that can happen to your spoon sweet is that it will not be very crunchy. Spoon sweets are usually offered to guests served by the teaspoon in a small china or crystal dish, with coffee or tea and cold water. Originally they used to serve them in a big bowl where everybody would take a piece from there in order to prove that there was no poison in it. I remember them served in basket shaped bowls made of pure silver, which had places for the silver spoons to stand round the basket, which was filled with the spoon sweets. Today’s recipe, “Glyko Karpouzi” is made using the rind of watermelon. In order to make this spoon sweet the rind should be at least two centimetres thick. Cut slices about 6 – 8 cm., and remove the outer green skin and as much red flesh as you can. 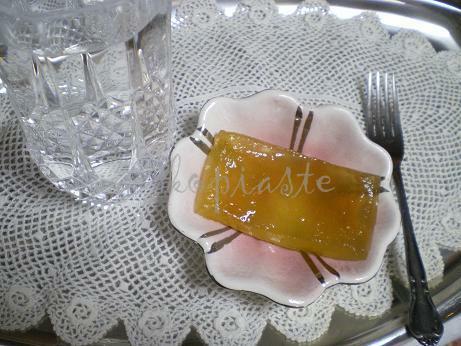 Spoon sweets are traditionally served with a cold glass of iced water. Before going to the recipe, you can also see a revisited recipe of mine made with mini watermelons: Aromatiko Glyko Karpouzi with mini Watermelons (Fruit Preserve). Peel and cut the each slice of the rind into smaller pieces about 5 – 6 centimetres long. Put the peel pieces into a large bowl with pickling lime and water (or cover with cold water and the lemon juice) and leave it for an hour. Rinse thoroughly before proceeding to next step. Drain the peel into a large colander and rinse under cold water. Return to the bowl, cover with fresh cold water and add half the lemon juice and leave to soak for a further 30 minutes, then drain. Dissolve the sugar in the water in a large saucepan, then bring to a gentle simmer. Add the drained watermelon rind and the lemon peel, cover and slowly simmer for about 1.30 hours until the syrup is dense. When ready, the ‘glyko’ turns a shade of transparent yellow. Five minutes before the end add the geranium leaves (or vanilla) and remaining lemon juice and toss saucepan. Remove from the heat. Allow to cool and transfer to sterilised jars. If you like you can cut it into smaller pieces before storing in the jars. Spoon sweets do not need to be stored in the refrigerator but watermelon preserve is best if served cold. Ivy, I very much enjoyed these two postings on watermelon, especially the part about it being a natural viagra! 🙂 Thanks for sharing! Sam, we have to feed our men well (lol). And still another recipe!!!! Wow, you know what I would have done with the peels? Give them to my sister Anna… she’s got turtles in her country house and they love watermelon peels! I would have never thought of doing something out of them! Nuria, you must try this. It’s so easy to make and believe me it’s delicious. Yum – I am loving this spoon sweet. Cake, wish I could send you some. Valli, it’s easy to make and delicious. Hi Kalyn. Have to feed our guys more often (lol). Ivy, thanks for steering me this way. This sounds like a great thing to try with watermelon rinds or about any fruit for that matter. It's very interesting with the history of spoon sweets and an elegant way of serving them. I'm so happy to learn a new method for the rinds. Thank you! Thank you Pam. We learn from each other. WHERE IN HEAVENS NAME DO WE BUT ASVESTI NO ONE KNOWS WHAT I AM TALKING ABOUT! Your comment is a little bit rude Antonia. When you write in capital letters it's like shouting at someone. Anyway, asvestis is quick lime. In Greece and Cyprus we buy it at supermarkets. Now I cannot guess where you live so I can't help you. However, you can order it online. Anyway, asvestis is quick lime. In Greece and Cyprus we buy it at supermarkets. Sorry I had to get rid of the part mentioning that watermelon is a natural v****a as got more than 300 spams. Wow! I’ve never heard of Spoon sweets. I’m going to make some now though! 🙂 Thank you for sharing!